The Czech lands (Czech: České země) are the three historical regions of Bohemia, Moravia and Czech Silesia, which since 1 January 1993 form the Czech Republic. In a historical context, Czech texts use the term to refer to any territory ruled by the Kings of Bohemia, i.e., the lands of the Bohemian Crown (země Koruny české) as established by Emperor Charles IV in the 14th century. This would include territories like the Lusatias (which in 1635 fell to Saxony) and the whole of Silesia, all ruled from Prague Castle at that time. 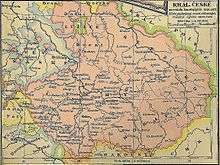 After the conquest of Silesia by the Prussian king Frederick the Great in 1742, the remaining lands of the Bohemian Crown—Bohemia, Moravia and Austrian Silesia—have been more or less co-extensive with the territory of the modern-day Czech Republic. The term Czech lands has been used to describe different things by different people. While the Czech name of Bohemia proper is Čechy, the adjective český refers to both "Bohemian" and "Czech". The non-auxiliary term (i.e. the term used in official Czech geographical terminology lists) for the present-day Czech lands (i.e. Bohemia, Moravia, Czech Silesia) is Česko, documented as early as in 1704 (the latin sources mentioning the expression, and its meaning at that time, i.e. just for Bohemia). Czech lands under Boleslav I. and Boleslav II. The Czech lands had been settled by Celts (Boii) from 5th BC until 2nd AD, then by various Germanic tribes (Marcomanni, Quadi, Lombards and others) until they moved on to the west during the Migration Period (1st-5th century). At the beginning of the 5th century the population has decreased vigorously and the first Western Slavs came in the second half of the 6th century, according to mythology led by a chieftain Čech. 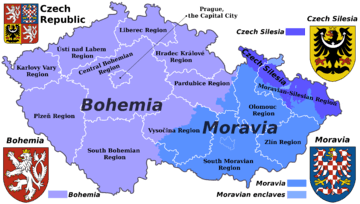 In the course of the decline of the Great Moravian realm during the Hungarian invasions of Europe in the 9th and 10th century, the Czech Přemyslid dynasty established the Duchy of Bohemia. Backed by the East Frankish kings, they prevailed against the reluctant Bohemian nobility and extended their rule eastwards over the adjacent Moravian lands. In 1198 Duke Ottokar I of Bohemia received the royal title by the German anti-king Philip of Swabia. Attached to his Kingdom of Bohemia was the Margraviate of Moravia established in 1182 and Kłodzko Land, the later County of Kladsko. From the second part of the 13th century onwards, German colonists ("German Bohemians") settled in the mountainous border area on the basis of the kings' invitation during the Ostsiedlung (in Prague they lived already from the early 12th century) and lived alongside the Slavs. The Silesian lands north of the Sudetes mountain range had been ruled by the Polish Piast dynasty from the 10th century onwards. While Bohemia rose to a kingdom, the Silesian Piasts alienated from the fragmenting Kingdom of Poland. After in 1310 the Bohemian crown had passed to the mighty House of Luxembourg, nearly all Silesian dukes pledged allegiance to King John the Blind and in 1335 the Polish king Casimir III the Great officially renounced Silesia by the Treaty of Trentschin. King John had also acquired the lands of Bautzen and Görlitz (later Upper Lusatia) in 1319 and 1329. His son and successor Charles IV, also King of the Romans since 1346, incorporated the Silesian and Lusatian estates into the Bohemian Crown and upon his coronation as Holy Roman Emperor confirmed their indivisibility and affiliation with the Holy Roman Empire. In 1367 Emperor Charles IV also purchased the former March of Lusatia (Lower Lusatia) in the northwest, however, during the Thirty Years' War both Lusatias passed to the Electorate of Saxony by the Peace of Prague. After the Bohemian Crown (Crown of Saint Wenceslas) passed to the House of Habsburg in 1526, the Bohemian crown lands together with the Kingdom of Hungary and the Austrian "hereditary lands" became part of the larger Habsburg Monarchy. In 1742 the Habsburg queen Maria Theresa lost the bulk of Silesia to Prussia upon the First Silesian War, part of the War of the Austrian Succession. 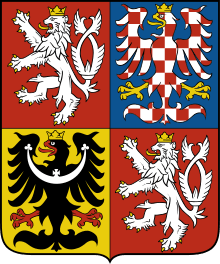 The coat of arms of the Czech Republic incorporates the coats of arms of the three integral Czech lands: Bohemia proper, Moravia and Czech Silesia. 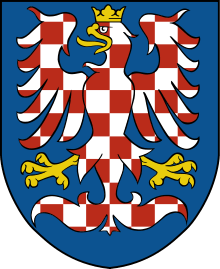 The arms of Bohemia originated with the Bohemian kingdom, like the arms of Moravia originated with the Moravian margraviate. 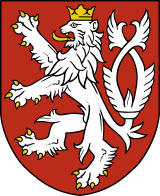 And finally, the arms of Czech Silesia originated as the arms of all of the historical region of Silesia, much of which is now in Poland.